PM Modi's focussed attacks on the Congress come against the backdrop of efforts among opposition parties to put up a united front against the BJP in next year's general elections. PM Modi repeatedly described the Congress president Rahul Gandhi's attacks as "childish". 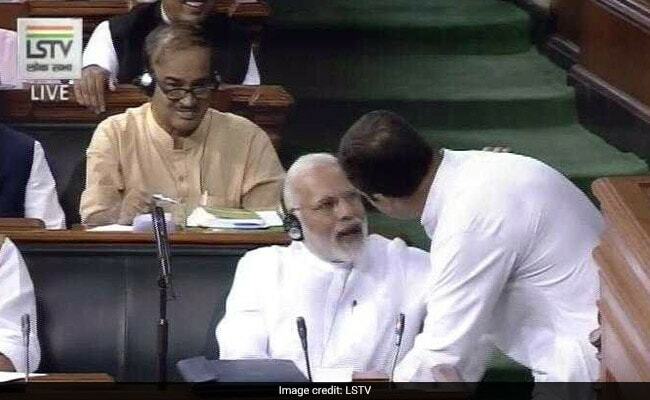 PM Modi repeatedly described Rahul Gandhi's attacks as "childish"
Prime Minister Narendra Modi designed his reply to Friday's parliamentary debate on the no-trust motion against his government as a sharp takedown of the Congress that has been attempting to unite opposition parties for the 2019, projecting the party as an unreliable partner that was using the floor test in parliament to test its potential allies. But he reserved his harshest criticism for Congress boss Rahul Gandhi. PM Modi repeatedly described the Congress president's attacks as "childish" and called the Congress support for the no-confidence motion as an effort to establish Rahul Gandhi as leader of the coalition of opposition parties that he is trying to build. "This isn't the government's floor test. It is the Congress' floor test for its so-called partners... to get him vetted by others as the coalition's presumptive prime minister," PM Modi said ahead of the trust vote that the BJP-led national coalition won by a whopping two-third majority. The Congress is in talks with Mayawati's Bahujan Samaj Party for an arrangement in Madhya Pradesh and Chhattisgarh. In Uttar Pradesh, Akhilesh Yadav's Samajwadi Party and the BSP have already defeated the BJP more than once in Uttar Pradesh by-elections. PM Modi also brought up Rahul Gandhi's remark that he was ready to be Prime Minister if the Congress emerged as the single largest party in the 2019 national election. It was a sign of his arrogance, PM Modi said. "What about the ambitions of others... There is confusion on this," he said, telling Mr Gandhi to prep for a no-confidence motion that he could move in 2024. PM Modi's move to single out the Congress and remind its potential allies about the party's history of ditching partners is seen as part of a BJP strategy to discourage opposition parties from tying up with the Congress. The BJP also hopes to raise doubts about the stability of the non-BJP front. It wasn't a standalone effort. Just hours before PM Modi spoke, Home Minister Rajnath Singh had also taken a sharp swipe at how there wasn't a single party that could have moved the no-trust motion on its own. It needs the support of a minimum of 50 lawmakers and there wasn't one opposition party that had qualified. So they had to come together. Like PM Modi who underlined the opposition's "negative politics", Rajnath Singh said that the opposition front was essentially a very fragile structure where political parties did not agree with each on policies or leadership. "The coalition will collapse once they start talking about leadership," he said, an oblique reference to the prime ministerial ambitions of the regional satraps such as Bengal's Mamata Banerjee and Mayawati. The Congress, the home minister cautioned, is in such doldrums that it won't go down alone but would also take down its new partners.